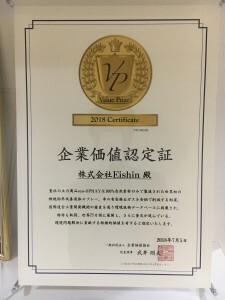 Value Prize Certificate 2018 Received! An article on eco-SPRAY is featured in Sankei Biz!! We supported the Audi Team at the Fuji San Super Taikyu Race!! eco-SPRAY Study Session Held in Bangkok!! We participated to the African Business Networking Fair 2018!! Copyright c EiShin Co,.Ltd. All Right Reserved.